Glacier Park Lodge is an historic hotel, it was built in the early C20th and is a log cabin construction; the main lobby is three stories high and supported by huge whole Douglas fir tree trunks. The Lodge is about an hour from the park entrance so we spent one night there before transferring to St Mary’s Lodge which is a five-minute walk from the entrance! We will have another night at Glacier Park Lodge before we leave for Seattle on Sunday evening. 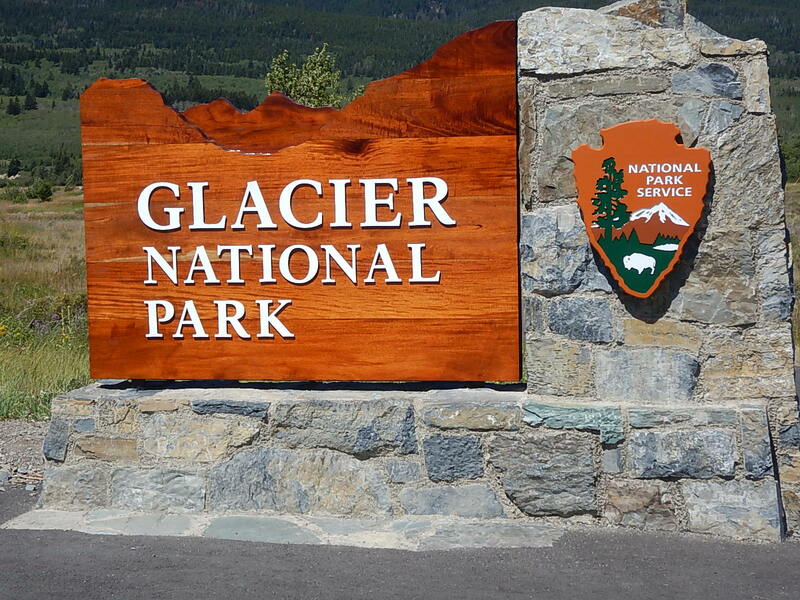 The ride from one hotel to the next took us through the Blackfeet Nation Reservation, Glacier Park is the traditional tribal land of the Blackfeet Nation and has great cultural and religious significance for them. Unfortunately, the treaty which took the land into Federal Government control pretty much excludes the Blackfeet from accessing the land; they now live outside the park in and around a town called Browning, where their main income is from beef cattle and lumber. … When we purchased our park pass we were given a local park newspaper, a map, a leaflet about the National Park Service and an information sheet on hiking in bear country, we stuck them in the rucksack to read later. We got a park shuttle to the boat dock, picked up our tickets and found a bench on the edge of the car park to enjoy the lake view until our boat arrived. After about 15 minutes Mark noticed something out of the corner of his eye, we looked around to see a Black Bear emerging from the bushes about 15 feet behind us!! We quickly (and calmly?) hid behind a 4-wheel drive van parked in front of us while trying get the attention of the people sunbathing on the dock wall oblivious of the bear approaching them. After a couple of minutes the bear wandered across the car park and disappeared into the bushes on the other side. We had hoped to see a bear, maybe across the lake, through the binoculars but that was a bit close for comfort. We have now read the Bear safety leaflet which says to keep a minimum of 100ft between you and a bear – pity nobody told the bears that! Here are just a few of the pictures we took, as you can imagine there are lots more but hopefully these will give you a flavour of Glacier National Park. St Mary Lake boat tour. Best to have a bear in front than a bare behind!!!! Q: What type of socks do Grizzlies wear? A: They don’t they prefer bear feet! Boom, Boom.